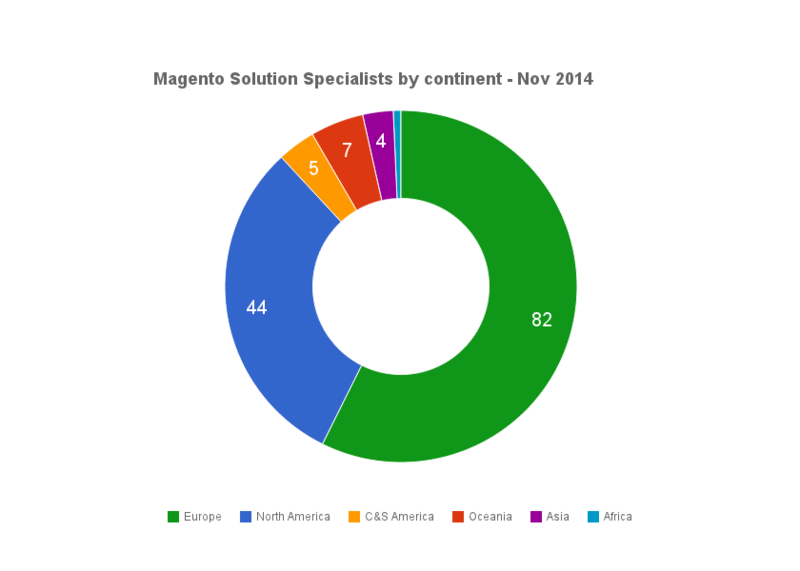 How many Magento Certified Solution Specialists are there? Which country, city, solution partner hold the most badges and what are some of the trends that can be seen throughout the first 6 months of Magento’s latest official certification program? 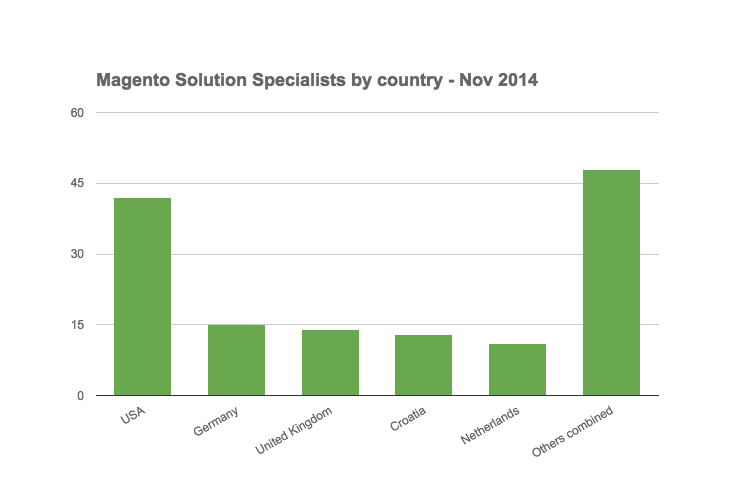 Check it out in the second State of Magento Solution Specialist Certification report by Inchoo. Many things have changed in the three and a half months after I published the first report of this type. Back then Europe was in a slim lead over North America while USA accounted for almost half of all solution specialists worldwide. Well, some things have clearly changed since July, and here are some of the stats and trends to keep an eye on. Since the last report Europe has more than doubled the number of MCSS badges with the total of 82 (compared to 38 back in July) while only 11 new certificates came from USA (the total of 42 – a 35.5% increase compared to July’s 31). We’ve also welcomed first certified solution specialists from Africa (one in South Africa) and Oceania (4 in Australia an 3 in New Zealand). At the moment of drafting this report there are 143 certified solution specialists out there (well, those that are publicly listed to be more accurate) coming from 32 countries worldwide. So, Europe grows stronger and a number of new countries are popping up on the MCSS map – which is understandable as Magento clearly is becoming more and more of a global eCommerce solution, and that’s a great thing, right? Right. This is even more apparent if we take a look at the certificates by country chart – USA tops the charts with 42 but it now accounts for “only” 29% of the world total (143) – back in July USA held a whopping 43% of the global certificates (31 out of 74). There are 7 people on this list that deserve to be mentioned as they made a special effort to collect all four available Magento certification badges (MCD, MCD+, MCFD and MCSS), so here’s a quick shout-out to these seven amazing individuals – congratulations, guys! So, what do we know 6 months in? It’s been full six months since solution specialist certification rolled out and we were happy to work our way through the training materials right away. Honestly, preparations for the exam were really useful for everyone involved as they brought us back (especially some of our senior developers) to the basics and allowed us to step back a bit and take a look at Magento as a whole – something that somehow gets lost in a bunch of custom projects you’re involved at all times. Is this a useful investment? In our book – certainly. However, it depends on what your starting position is – for most of us who have been around Magento for 5-6 years, the preparations and the actual exam are nothing to fear and most of us passed it more or less easily. So, it really doesn’t require that much time to prepare. And let’s be honest, we’ve all spent much more than $260 on some things of questionable usefulness. Will it (or does it) lead to more, bigger, better clients for companies who get their people certified? Time will tell, but in our experience it is a good extra selling point as more and more clients will be in need of a real solution partner rather than “just” a development company, so positioning yourselves as someone who can not only deliver great code but be there as a true partner for a new or established eCommerce business is something that will be essential for companies like ours. Have you already gotten your certificate? If not, what’s stopping you? If yes, what benefits to your organization do you see? There’s also a possibility that not all people who got certified made their profiles publicly searchable, so the actual number of certified developers is probably a bit higher. I have read your article. Front-end Magneto certification helps to magento developers carrier, I recommended all magento developers, they must be passed the exam for better future. I just saw this article and thank you for that! I hope to see you soon guys (the whole team) ! If you’ve been around Magento for quite some time, especially in a developer role, you have it easier. You should then make sure to click around admin sections of Magento (both CE and EE), remind yourself of some of the scopes for various settings (global, website, store view), and brush up on your overall eCommerce knowledge (some basic concepts and standards). Here is one really useful and extended study guide by our Canadian friends at Demac Media – http://www.demacmedia.com/magento-commerce/magento-certified-solution-specialist-study-guide/ – I hope you’ll find it useful as an additional resource. Good luck, make sure to let us know once you pass the exam! Can someone guide me out through who to prepare for Magento Solution Specialist exam (apart from using of Study guide)? ?